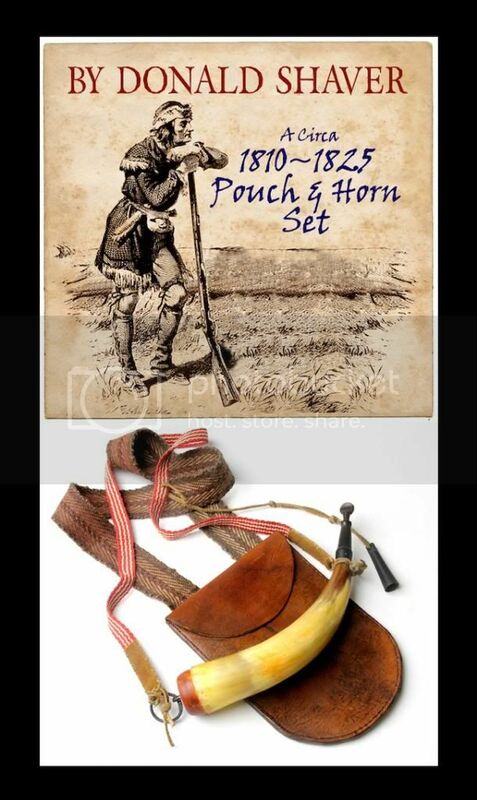 CLA artist Donald Shaver handcrafted this circa 1810 to 1825 hunting pouch and horn set for the 2013 CLA fundraising auction. The pouch is based on the one seen on page 25 of Madison Grant’s book “The Kentucky Rifle Hunting Pouch”. He crafted the traditional deep “D” shaped pouch itself from bark tanned cow hide and like the original that had a strap made of old time “listing”, Donald used an old woven strap that he had on hand, made by C.J. Wilde of Wilde Weavery. Like the pouch, the accompanying powder horn is based on an original too – one in the museum at Old Fort Harrod State Park, Harrodsburg, KY. The unique engraved brass base plug decoration with its hand forged iron strap ring and staple arrangement closely copy the original, and serve to set this piece off. The horn hangs on a separate woven cloth strap, and is outfitted with a handmade powder measure. In Donald’s words, “This hunting pouch set is representative of many others that once served our American backwoodsmen during the war of 1812 era” and is his way of showing how the often overlooked old time skills used to make them can be preserved so they don’t just fade away. After years of study and research, today he portrays the living history persona of an 18th century Woodland Indian. As a result of his devotion to correctly interpreting these native people, he is frequently asked to model for nationally known historical artists. His interests also include blacksmithing and working with horn, especially making powder horns. About his creation of the hunting pouch and horn set he made and generously donated to the 2013 CLA Fund Raising Auction, Donald has this say, “I wanted to donate his pouch and horn set to our fundraising auction to help further the preservation of these skills, and encourage the continued showcasing of the artists.